I was hoping you could read the "thread" of this conversation here, but I guess you will have to go to the post on Facebook. A really interesting discussion on success, quality, and social proofing in art. Anyone can see on the convo on FB. FB members can join the convo and comment. If you are interested in reading the comments just hover over "comments" and click. hot for February NC mountain potter, anyway! lint haters gonna hate. I'm trying to come up with words that might describe my experience as a presenter at the Florida Heat Surface Conference. 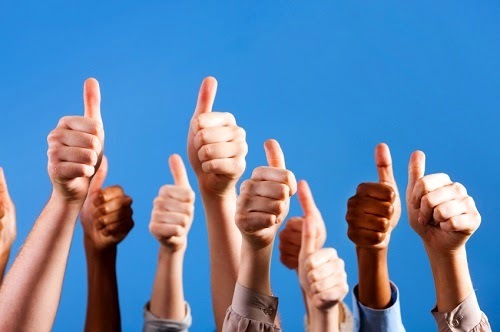 I could use some of my favorite one word comments like, awesome, cool, amazing, fantastic, unbelievable, etc. But how many times can one use these and still get an idea of real excitement across? KK was wise to just to keep it to a few amazing pictures. She said she would leave the writing to me. Ha! The daily schedule varied by presenter and we each got to demo with a different person each day. There was a work room "backstage", that was always busy with demo prep and wheels spinning. I seemed to have stuff spread out all over. Since I was the only presenter to drive to the workshop and consequently I had a lot of stuff! I filled the car with some of my home clay, lots of finished pots that were sold in the gallery, and lots of bisqueware for painting and firing. Too much really, but better to have too much than too little. Adam Field layin down the glaze doctrine! Adam and I started things off with a glazing/deco demo on Wednesday morning and ending up loading 2 kilns. Soda and salt. 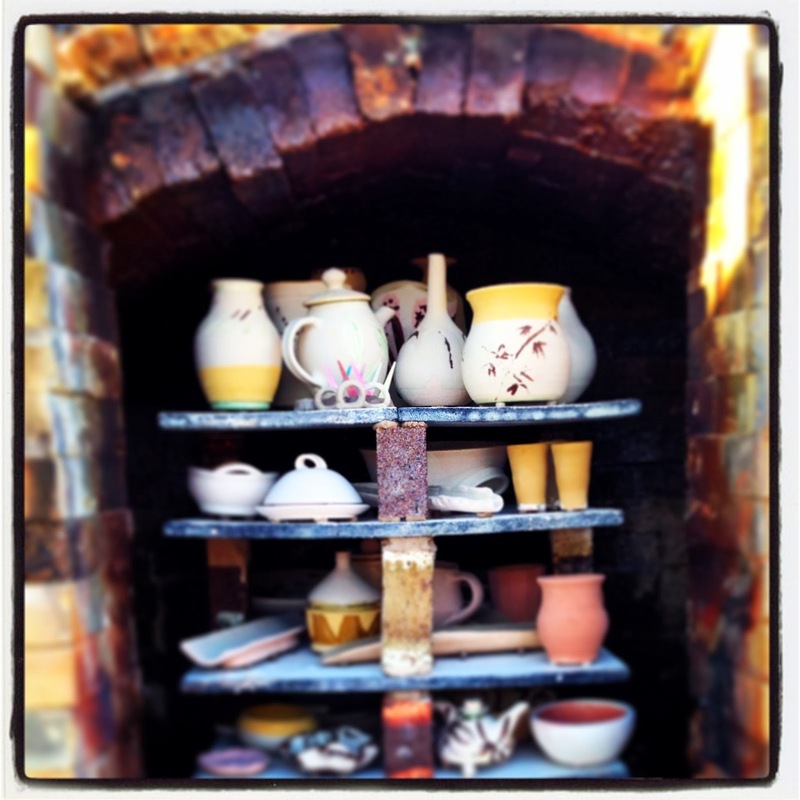 SO I was glad to have brought extra pots to help fill the kilns. 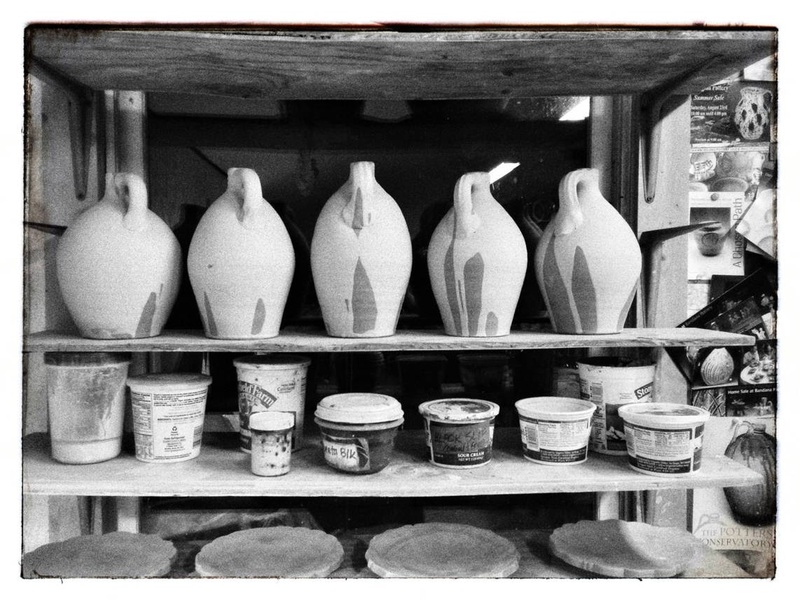 waxed and glazed work for the salt kiln. really nice deco! It was a LOT of work, but the prospect of firing and getting pots before the weekend was over was exciting for everyone! 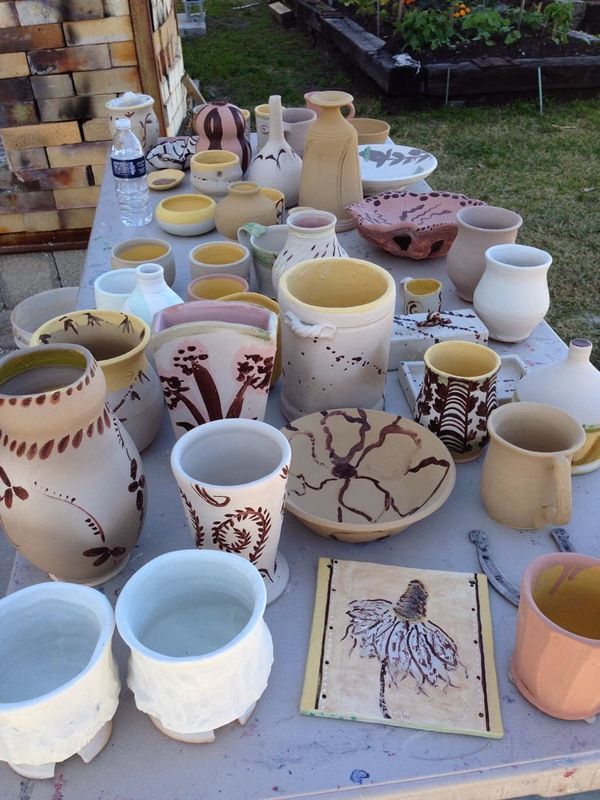 As for me, I was a little anxious about firing that kiln that was a stranger to me, not to mention the pressure that fell on my shoulders for a successful firing. Hey, but that's why I get paid the big bucks, right? Re-entry to my chilly mountain life after a week in Florida has been the normal treacherous segueway that it usually is. The charmed perspective that travel gives is a direct result of the lack of the routine and the responsibilities one leaves behind. But now that I am back the "chickens have come home to roost." I'm juggling these chickens and, at the same time, organizing the ideas and awesome experiences from the Florida Heat Surface Conference so that I can present them here. But that will have to wait, maybe another day as life gets in the way. But it's great to be back in the bosom of our little house here on Snow Creek Road. In the meantime, I thought it would be a good time to plug 2 of my favorite potter bloggers. Check these posts out when you can. 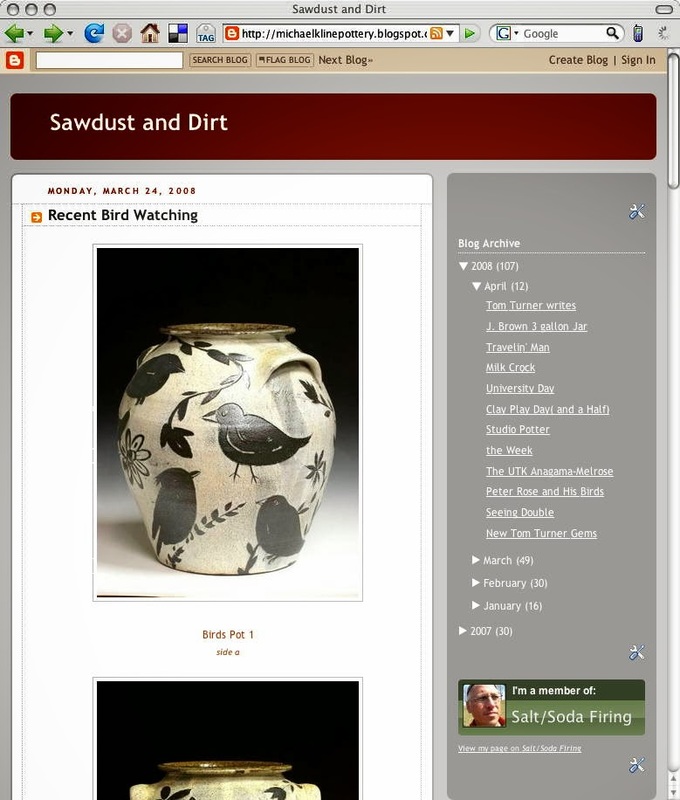 I love that Scott and Carter dive deep into the writing and share the many trials and tribulations of pottery making. Their writings make our world a little smaller and help us realize the common threads that connect us as makers. Scott Cooper's "Dr. Strangethrow, Or: How I learned to stop sitting and love the Brent"
Here is this week's FB Ceramic Index. For this post, I've sorted the list to reflect the fastest growing pages from the last two weeks. If you would like to see the complete (to date) list click here. If you are interested in looking at the artist's pages, you can click on their names to be magically transported to their FB sites. Of the current roster of ceramic Facebook Pages, these artists saw the biggest positive change in their following in the last 2 weeks. It could have been from active posting and/or sharing, or an invitation campaign. Anyway, I hope you discover some artists that you weren't aware of and find this information useful! It has been a beautiful day that started with some ice skating on a NC mountain top and ended with an intriguing episode of our favorite soap from Masterpiece, (not to mention an earthquake in the hometown of southern celadon, Edgefield, S.C! 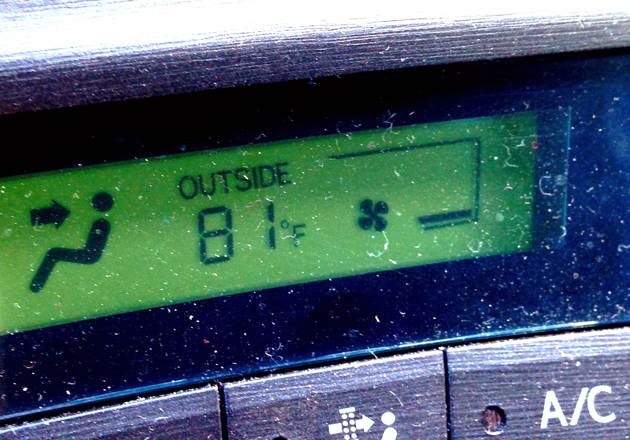 Yet, it remains February and cold. Ice and snow and cold winds blow. 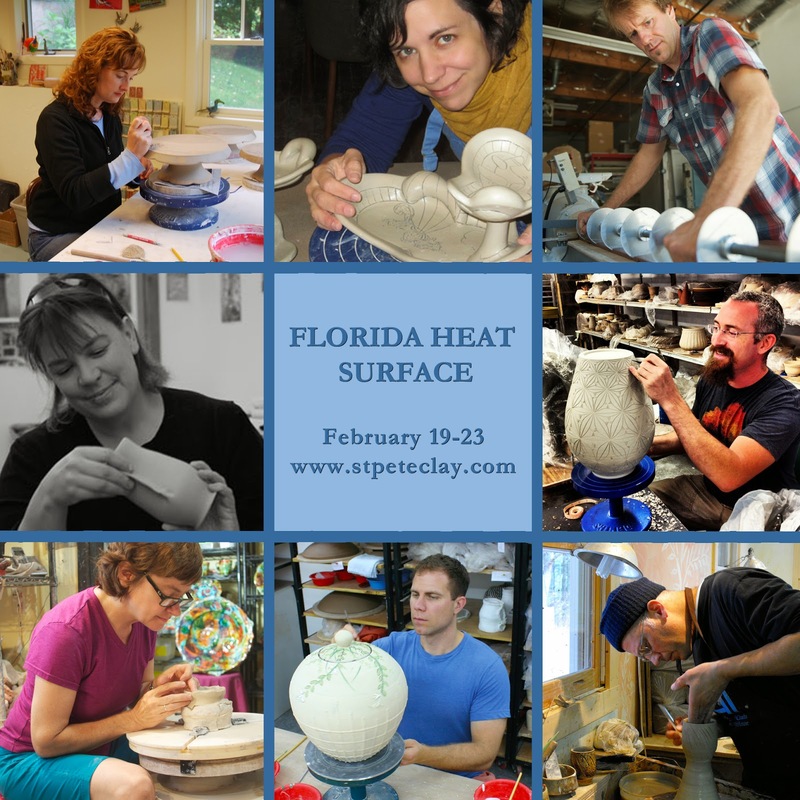 But I have sights set for St Petersburg Florida and St. Pete Clay's Florida Heat Surface Extravaganza coming this week! 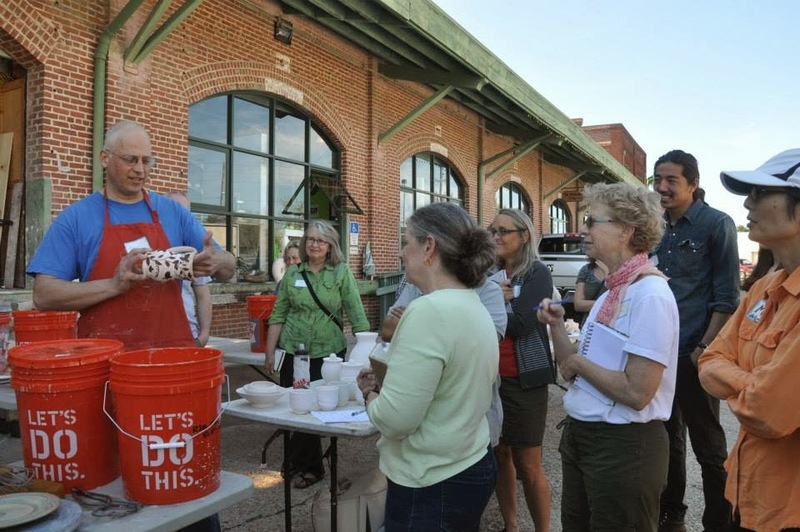 I can't wait to work among some of my favorite potters and, of course, steal some of their tricks, for sure! maybe I will see some of you there, too? In a spin, I'm loving the spin I'm in"
I'm in a spin, for sure. But I don't know if I'm "loving" it. I'm a little dizzy, and sleep deprived, to be honest. But I do like these swirl mugs that I made. Tomorrow I will load these in the salt kiln up at Penland for a good salting! Then it's off to Florida for some Heat! Tomorrow begins the clumsy transition between the wetness and sloppiness of shaping pots at the Shimpo to the dressing up with patterns of carefully painted wax resist brushwork. Pottery making is full of paradoxes and the dance between the impermanence of damp clay and the rock hardness of the fired pot usually has me standing with my back to the wall, waiting for the right song to inspire me to the dancefloor. Always a little shy and wallflowerish, I'm reluctant to let go of my slippery spinning world of forming for the whirling of the brush mark on the lovely beautiful pink bisque. I wonder why? Bisqueware stands somewhere between its ceramic puberty and its vitrified adulthood, always a little awkward, uncomfortable in this transitive state. Impatient as a not-yet-old-enough teenager to drive. My work on the Facebook Clay Artists Index is taking a back seat to my work in the studio as I prep for a firing later this week but I wanted to offer you this group of pages for this week's Index. The complete list is growing and includes almost 300 artists and hopefully I will be able to configure a page with all of them soon. I know there are so many more out there that haven't been added to the Index yet, sorry. This is becoming bigger than I anticipated. So, thanks for your patience. I hope you can check out these artist's pages and I'll have another group for you next week! Directions: you can scroll down in each individual box to see posts in reverse chronology. If you want to go directly to the FB page to comment or like, just click on the post. All the while pots wait for handles, feet, and lids. Today I will balance my time between the throwing at the wheel and chasing plastic around the table. Also looking forward to Lillian's basketball game this afternoon. Hoops and jumping through hoops. Hope you are having a great weekend! Feeling nostalgic after yesterday's blogiversary, I put this list together during my lunch break. It contains the blog posts from some of the early pottery blogs that I followed back in the early days and some that jumped on the blog-wagon in the years to follow. I couldn't find some blogs as they seem to have been discontinued and/or have been taken over by robots selling septic tanks and viagra. I'm sure I left some out, but if you can think of someone I forgot or am leaving out please leave that in a comment. I want to use this list in my NCECA talk. Thanks! So here you go on your trip down memory lane! Click on the potter's name to go to that post. The list is in order of the date of the first post. Today is the anniversary/birthday of ye olde Sawdust and Dirt blog! My first blog post was 2/6/2007! You can read that first post here. And my my! How times have changed! 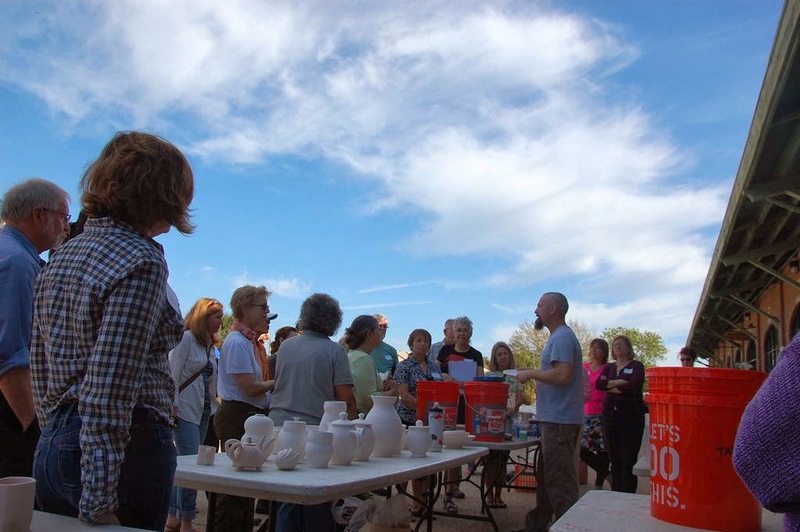 While there was scattered contempt in our field of the early adoption by potter bloggers, these early blogs opened the many doors and windows into the potter's work to the pottery community at large. As we became comfortable with the technology of sharing through the blog, the community expanded with the likes [no pun intended] of Facebook and later Instagram (among others) as that online community grew worldwide. Although joining the world of FB was slow in our field in those early days it eventually became a huge presence in our lives. and how we keep up with each other. Because of the Facebook explosion and it's ever increasing community and functionality, my blogging slowed down and eventually I gave it up for a short time. FB just seemed to be easier and the I tried to reach a slightly wider audience of not only potters, but collectors as well. Eventually I came back to the blog because it was a more appropriate format for me to dive deeper into ideas. Besides, it was a better archive and easier to search. Blogging is still, for me, a better format for writing, while Instagram and it's parent, Facebook are better visual storytelling. 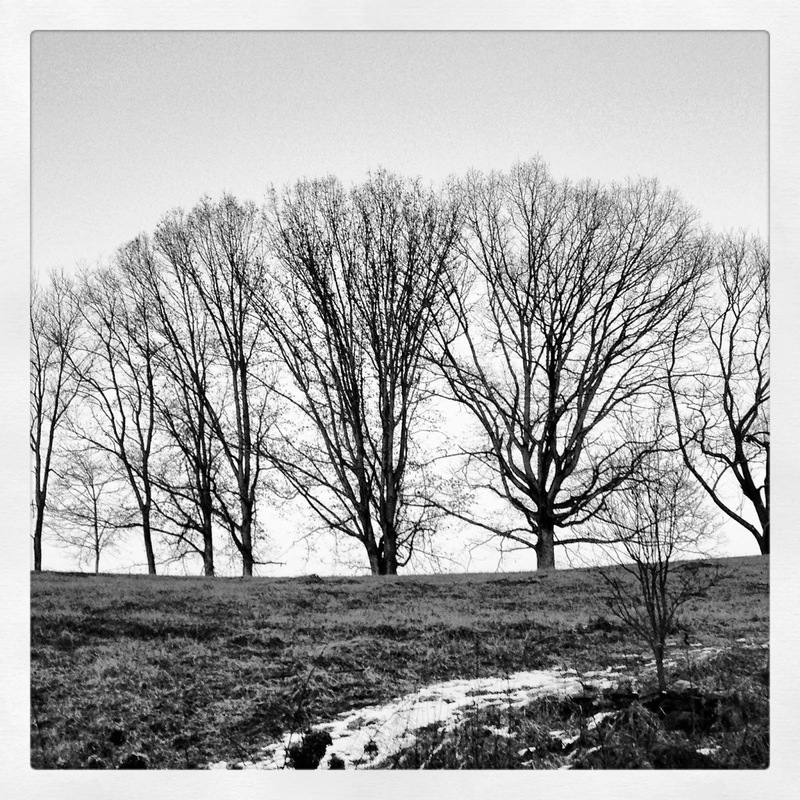 Today I maintain a Facebook presence, an Instagram stream, AND try to write on this blog occasionally. Although these communities sometimes seem like a hall of mirrors, there are still folks who haven't adopted FB and IG, or have tried and dropped it. Well, I'd love to write more about this subject, but my Shimpo Scream awaits me. I will be speaking at NCECA about social media next month and will be sharing more thoughts on where all of this is going for me, personally. So for now, I wanted to thank all of you who read this blog and have supported me over the years. I especially want to thank Ron, Shane, Emily, Doug, Hannah, and all the others who inspired me to take the time to start a blog. As the times and the technology changes, I think we will always have a hunger to be better at what we do and I think by taking the time to share what we do in whatever ways we can with each other, satisfies that hunger and helps to make our ceramic culture the best it can be. And of course, thanks to all 577, 039 visitors to the blog (to date so far). Without your support I probably wouldn't be here today. As the saying goes, sometimes you just have to remount the horse. My 500 word a day goal must have short circuited the wiring in my bloghead. It appears that despite my best efforts to NOT make any New Year's resolutions, I swung for the fences (or the stars, or the tree tops), and imploded. 1. I managed to make my yunomi for the annual AKAR Yunomi show and Kyle Carpenter was kind enough to include them in his recent firing. Thanks KC! 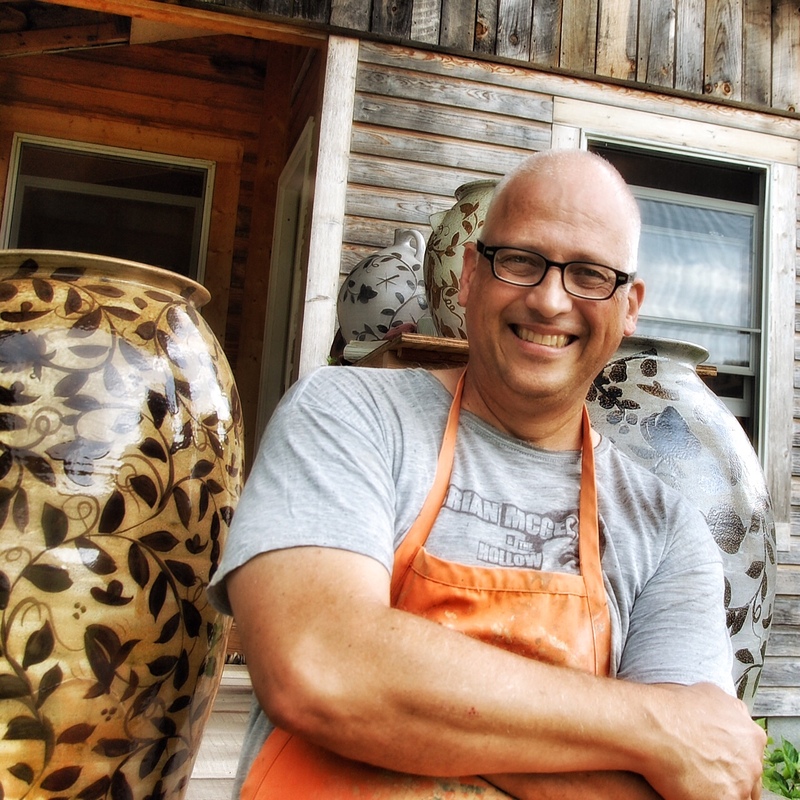 Check out Kyle's beautiful pots that are now available for purchase. 2. After 6 years I finally have a supplementary heat source! I hooked up the propane heater in my studio with the help of my farming friend Ronnie B. This is a really big deal for me, especially in the month of January when it gets really cold and I'm not always in the studio to keep the wood stove going. I can check that one off the punch list towards my official C.O. Now if I can just get my outdoor wiring redone I will give the inspector a call. 3. And finally, I have my Peter Pugger pug mill/extruder is back in working order, thanks to the Loafer's Glory Sandblaster and Spruce Pine's Superior Construction's fine welding! The pug mill repair was another one of those projects that seemed impossible. I mean, the thing is heavy! and although it has wheels it's not easy to get in the truck without help. So I'm really happy to have it back. The soft reclaimed clay that I have been running through it is is like a high octane boost to my February pottery fuel tank. I've discussed this before and I think there are definitely two camps. There's the "reclaim your precious clay trimmings and scraps against all odds and all costs" camp and the "are you stupid, ain't nobody got time for that" (reclaim) camp. I guess this old dog stands stubbornly and firmly in the former. There's just something really nice about that reclaim and it is a very old habit to break. I have missed that old Peter Pugger. Pugging my clay is part of my potter DNA or something. I just wasn't feeling 100% without it. 4. (Dis)Honorable Mention: almost forgot this rabbit hole. 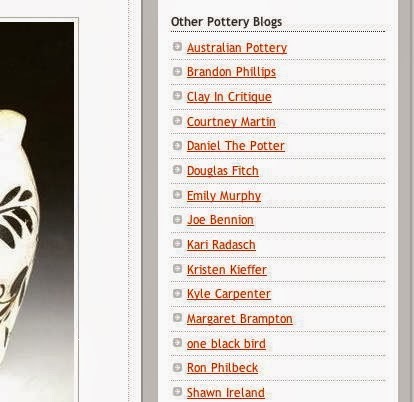 I opened a can of worms with my need to compile the "FB Ceramic Index" thingy. If you haven't heard, in the past couple of weeks, I've put together a list of Facebook Pottery/Ceramics Pages. You, (yes you!) can check it for the latest by clicking on the tab at the top of this page or here. ;) I personally wanted to have an easy way to track my favorite FB potters pages and thought there might be others like me. So i dug my teeth into some FB developer code and came up with this "beta" facebook Index. The total list is at about 300 now and growing but I've only had time to list 10I'm not sure I will be able to keep up with the research or fairly curate it but I'll keep trying. Hopefully Scott can come to my rescue and help out with his mad developer skillz. The current "Index" is a top 10 (w/ highest followers) FB Pages. 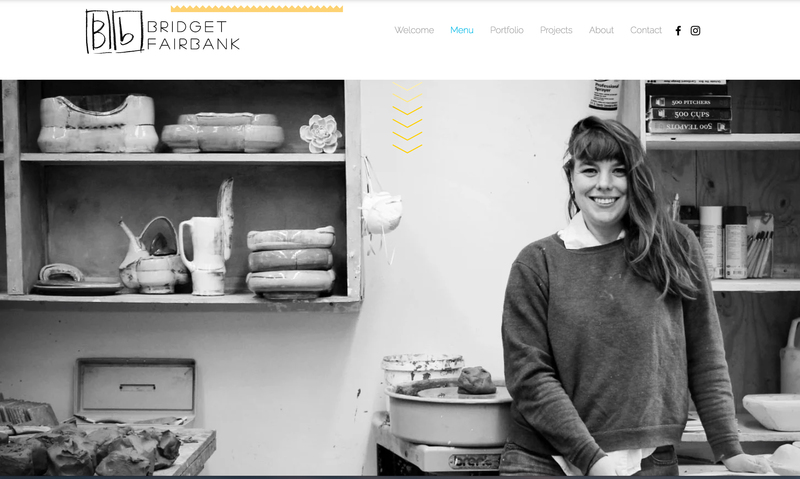 It's a great way to find clay artists. More and more are coming in every day and I'll try to update every week on Saturday. It's a live updating kind of FB "blog roll" of sorts, kinda. Not really sure. I'm hoping to find time to curate different lists. I had a suggestion to Index university clay programs, for example. Any suggestions are welcome. It's a work in progress. So, now here I sit, humbled and sheepishly tapping at the clickety clackety keys. Trying to get a feel for that writing thing while I should be chained to the wheel to get pots made for my upcoming foiring in about 10 days! I love your comments and feedback, so let me know what's up. I'm working on a new project. Just click here or click the Facebook Ceramic Index tab above. The Index updates automatically/live just like a blog roll. Scroll within the page block to see posts from the artist. Scroll outside the outside the FB page block or in the artist header to scroll down the Index page. Don't worry, you don't have to be a member of the Facebook world to look. :-) But if you ARE logged onto Facebook you can click the "like, comment" and will be redirected to FB. I appreciate all input as this is a work in progress. Thanks.